One of the best trends to emerge in recent years has to be the glamorization of loungewear. Who knew looking stylish could be oh, so comfortable! With the plethora of boyfriend jeans, sweatpants, wedge sneakers, baseball caps, duffle bags gracing the fashion scene, it's hard to ignore the fact that comfort wear is here to stay. Most street style looks combine loungewear with some other form of urban wear. Think leather, camo, drapey neutrals and lots of black. While I adore the edgy minimal approach to making sweats look chic, I also love the idea of glamming things every now and then with flirty feminine pieces in the brightest of colours. With Spring on the horizon, here's a few things I'll be wearing to get me through these last weeks of winter- a comfy sweatshirt, long line pencil skirt, pointy toed pumps, leather wrap bracelet and my beloved Trio. So tell me readers, when was the last time you wore sweats out of the house? Have you also caught the comfort bug? HOLY MOLY that skirt is spectacular! love this whole look! im having a great giveaway on my blog today and i would love for u to stop by and enter! well this is absolutely stunning!!! i absolutely love this trend, ive been pairing t-shirts and sweatshirts with everything these days including pencil skirts, leather shorts and maxis.......ps that skirt is AMAZING!!! pss i picked up the stuff for the edemame recipe this morning and i cant wait to make it today! You are a serious stunner, lady. This whole look is gorgeous! Jenee, you truly made that look your own, I love your wonderful personal style--those pink heels just make the look! A stylist friend of mine recently banned me from wearing sweatshirts (I have quite a collection of Wildfox sweatshirts). I sadly folded them all up and said I'd give them away--of course in less than a week I have snuck them all back into the closet, haha. I agree! The glamorization of loungewear has totally taken me over. But, it does mean I have to make an effort to glam it up too! =) Love how you glammed yourself. The skirt and those heels are prefect! Yes, I love comfortable clothes but I rarely wear track suits when going out - only to the supermarket if I absolutely have to... Love your skirt! Totally with you on loungewear – love dressing it up to wear out! Super cute look here – great colors. Only you could make a sweatshirt look high fashion- seriously! Great combination. I also really love the glamorization of loungewear, in part because I don't really wear sweats out of the house so this trend give me the perfect excuse to be both comfortable & stylish. so pretty! love the yellow skirt- so fem and gorgeous. xO! I love this combo! Sweatshirts and stilettos are too fun. Those pumps are fabulous, too, especially paired with the yellow! Oh my goodness!! I love love love this look. One of the best ones I have seen in a few weeks. That skirt is gorgeous! that skirt is killer! the length, the high slit in the front, and color . . . amazing! and pairing it with a sweatshirt, genius! you have such great style! that skirt and those heels and that collar, where do i even begin?? Thank goodness for the glamorizaton of loungewear, I would be lost without it! It's such a great thing. That skirt is incredible, I love the details! 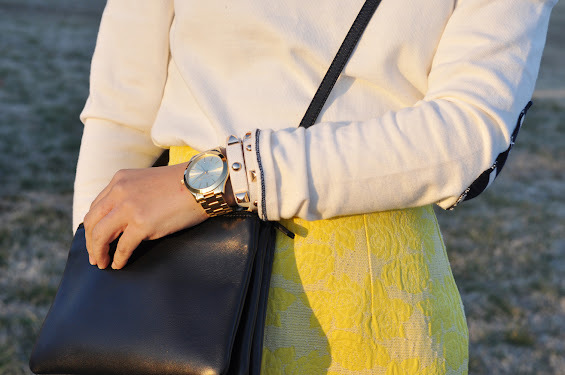 love this yellow skirt! you styled it perfectly! Jenee i think that yellow is "your" color. You look amazing. If you cannot find that pretty Celine of your's, it is most likely here in Atlanta and be prepared for some ransom money, lol. Happy Monday girl. Lounge wear now a days are not far from the regular blouses and tops. You make that Gap sweatshirt looks so glamourous! That skirt is amazing! I love the color and style! I had no idea that comfortable could be so chic! Is this the skirt that you said your husband was laughing about the other day?? I absolutely LOVE it. You look stunning. 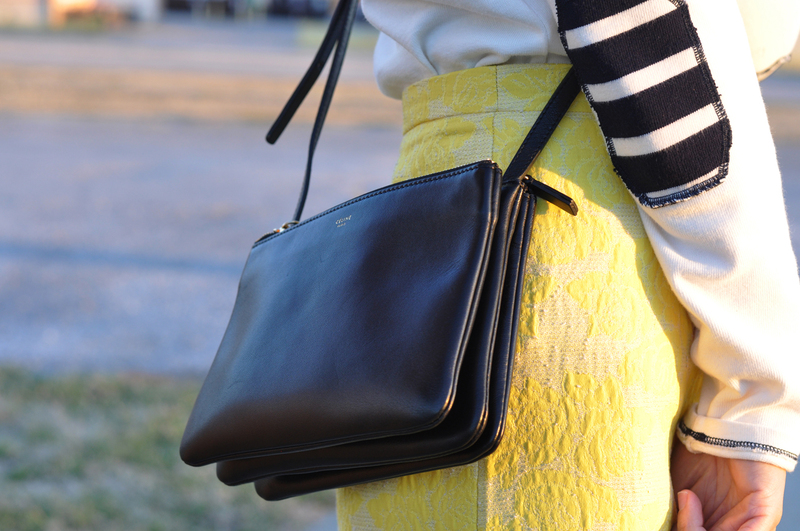 So happy for you about the Celine Trio- you wear it so well! Oh my goodness! In love with your skirt!!! So unique, original, and amazing:)! Come back to visit my blog soon:)! Miss seeing you around! Ha! This is my favorite way of dressing right now. I would like to go all out on the loungewear, but it doesn't look good, and by adding something more tailored you glam up your sweats and make the tailored pieces cool, win win. Your outfit is so much more sophisticated than mine would be, you look so stunning! Love the elbow patches too, overall more than win, win: a real winner! OMG, I just totally fell in love with this look, love every piece of it!! A true style and fashion winner! You wore the loungewear perfectly! I love the pops of colors with the shirt and shoes. I LOVE the skirt with the pink pumps. Perfect little colorblocking. I also like the laidbackness of the top verses the skirt. Loving this pop of colour and lovely pencil skirt! I love this look!! That skirt is fab and I love the elbow patches on your sweater! You may sweats look glamorous! I wear sweats ALL the time but they look so casual as compared to how you've styled yours here. Thank you for the inspiration. Love this skirt! And the combination with fuchsia shoes - lovely! I love the color combination in this outfit. THose shoes are amazing! you look SOO amazing!! i need those heels!! I love comfy stylish clothes. The elbow patches on your top is very pretty. I love elbow patches. The pop of pink in those heels are amazing. I'm swooning over that skirt and it's perfectly paired with those pretty heels! Just came across your blog - you have amazing style! Thank you so much for your kind words on my blog Jenee <3! Looking forward to your next post:)! What a gorgeous mix! Love the casual and dressy combo. The details on the sweatshirt are perfect to dress it up just enough to pair with that gorgeous skirt. Love it! Gorgeous outfit! I love that skirt. Love this look! The colors are Amazing! This skirt is just lovely! Those pumps really set off your entire look. Well done!